Product #47774 | SKU APLS20DDCLSKIT | 0.0 (no ratings yet) Thanks for your rating! 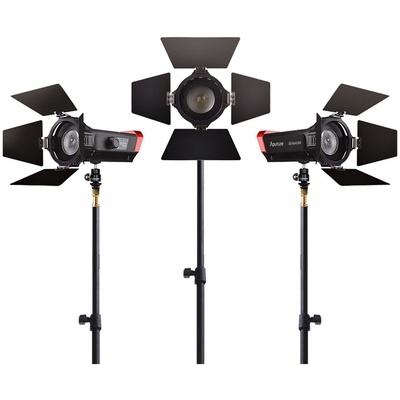 The LS-mini20 Daylight / Bi-Colour 3-Light Flight Kit from Aputure is a lightweight 3-point lighting setup that's great in the studio but also great on the road. Each light comes with a 4-way barndoors, an AC adapter, a NP-F970 battery with adapter and charger, a USB cable, a crab clamp, a D-Tap cable, a filter set, and a universal cold shoe mount. It all fits in the padded kit case. Three stands and a stand bag are also included. Part of the Light Storm series, the LS-mini20c Bi-Colour LED Head is a 22.8 x 12.2 x 9.7 cm light source that weighs just 570 g and has colour that's variable from 3200 to 6500K or anywhere in between to match other lights or ambient light conditions. Light intensity is also variable offering dimming from 20 to 100%. CRI/TLCI ratings are 96, indicating a faithful and accurate rendition of colour. The LS-mini20c has a wide 20-60-degree beam spread that can be shaped and controlled via the included 4-way barndoors. Versatile is an apt word to describe the light. Power options include the provided AC adapter or the kit's Sony NP-F970 battery. In fact, the LS-mini20c Bi-Colour LED Head can run on any standard 5V power bank or V-mount battery via a D-Tap cable. The LS-mini20d Daylight LED Head is a 22.8 x 12.2 x 9.7 cm light source that weighs just 570 g and has daylight colour temperature of 7500K for shooting outdoors or in locations with large windows. Light intensity is variable, offering dimming from 20 to 100%. CRI/TLCI ratings are 97, indicating an accurate rendition of colour. The LS-mini20d has a wide 20-80-degree beam spread that can be shaped and controlled via the included 4-way barndoors.